Experience superior sound and comfort, with a true wireless freedom and a stylish design. The B&O Beoplay E8 2.0 Wireless In-Ear Headphones are the pinnacle of high quality sound and style. With sound tuned by Bang & Olufsen acoustic engineers, these earbuds are designed to deliver the ultimate audio performance with natural sound. The in-built intuitive touch interface of the earbuds also ensure you can easily activate all your favourite features directly from the earpiece, such as taking calls, play/pause, skipping tracks and voice commands. Tapping the earpiece activates the customisable transparency mode so you can hear what is happening around you. 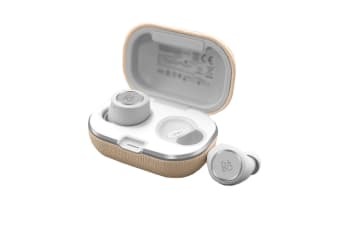 The epitome of style, the B&O Beoplay E8 2.0 Wireless In-Ear Headphones case is crafted with fine leather, aluminium, stainless steel and braided textile for enduring style. The case is also Qi-equipped for the full wire free experience. Now you can simply place the case on to a wireless charger to charge up for approximately 16 hours of playback time.